Promoting a business on social media isn’t really like promoting a business. Promoting content on social media is the better way to think about how social media works. Social media content promotion means focusing on adding value to social media rather than trying to make a sale. While you can always pay to reach your target audience, taking a combined approach of reaching people organically in addition to paid is a better long-term solution. I’ve written about the importance of social as opposed to media when it comes to social media but I didn’t cover the intricacies of different social networks. You can’t come right out and promote your business. Nobody will listen and you’ll get a bad reputation. You’re going for growing your business on social media but the magic word to achieving that is engagement. Engagement comes in different ways on different social networks. Every social media network is different when it comes to engagement and how you’ll reach your target audience. To properly reach your target audience and promote content on social media, you’ll need to understand who uses it and how you can best use each network for reaching people organically. The biggest changes in social media happen around Facebook as they move into more of a paid platform. You have to pay to reach your audience. In other words, pay to play. While you can create a business page on Facebook and post amazing content, you won’t reach many of the followers on your page. Organic reach on Facebook is limited but there are some ways you can reach more people. Facebook groups don’t have any limitation for who you can reach. The important part about groups is to find one that isn’t all small businesses self-promoting themselves. Find a group that’s in your niche to at least grow your audience and make new connections. Help people, meet people and have conversations to expand your presence and grow your connections. Jumping on Facebook to skim from group to group pushing your product will get you nothing but frustration and a bad reputation on social media. Another way to benefit from Facebook is to use Instagram which can be tied closely to Facebook. Instagram is owned by Facebook. When you post an image on Instagram it can instantly post on Facebook also. It’s easier to reach people organically on Instagram so by including a link to your Facebook page, you’ll reach new fans on Instagram and on your Facebook page. There are almost no similarities between Twitter and Facebook. Organic reach in Twitter is easier if you make meaningful connections. There’s nothing limiting your reach to people who follow you on Twitter. Twitter has many opportunities to make meaningful connections with people in your industry and your geographic location. You can use hashtags, Twitter chats, and geographic tags on your Tweets to reach people. Geographic Tweets can make it more likely that people in your area will see your Tweet. Like Facebook, LinkedIn has groups which let you connect directly to others in your industry. LinkedIn groups aren’t as useful as Facebook groups on most cases but if you find the right one they could benefit you for making industry connections. If your customer is a consumer then LinkedIn will only be good for connecting with industry colleagues. This can be every bit as useful as connecting directly with customers though. How you measure success with your social media content promotion will depend on what your goal is. Before you even do anything on social media you should determine your goals. With goals in mind then you’ll have a better understanding of how to reach consumers on social media. Your goals have to be realistic and specific too. “Get new customers” isn’t a good goal because it’s so broad and there’s a lot of steps in the process to getting new customers. Increasing brand awareness with your target audience is a better goal. Brand awareness is more specific and covers a step in the process to getting new customers. Social media can play a big part in every step of a consumer’s journey towards a purchase. There is no giant leap from customer to purchase and even the traditional sales funnel of the past doesn’t seem to be how the process works according to research. 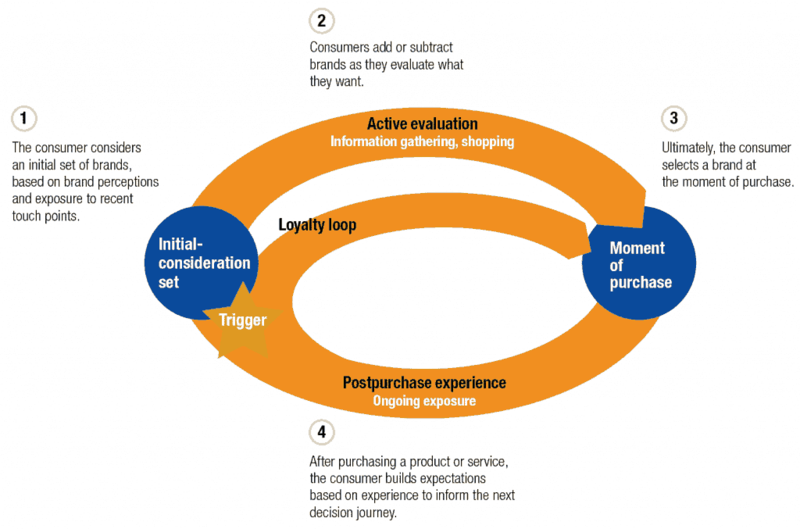 The process looks more like a circular process where social media can have a touch point anywhere along the consumer’s journey. Your measurement of success with social media will probably lie somewhere on this path and most likely all along the path. You probably won’t get an immediate sale from social media (if you do then you’re awesome!) but you’re going to reach new people. These new people are going to maintain contact with your company and become trusting in what you sell. Eventually, that will translate into a customer when the time is right. With the right setup and approach on each social media network, social media can become a great resource for connecting with people. Making connections with the right people leads to consumer trust and then they become a customer. The more you help people and become a valuable resource the more word of mouth you’ll generate as a great resource for people. Let’s get started expanding your small business online presence. Starting with an analysis of how your online presence is doing right now is the perfect first step. Request your free personalized Online Presence Report to see how you’re doing and where you can improve.